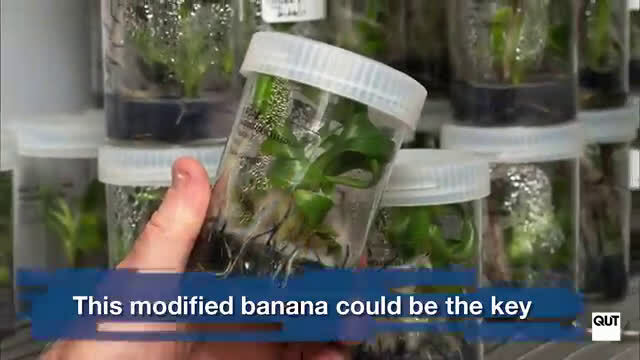 QUT researchers have developed and grown modified Cavendish bananas resistant to the devastating soil-borne fungus Fusarium wilt tropical race 4 (TR4), also known as Panama disease. 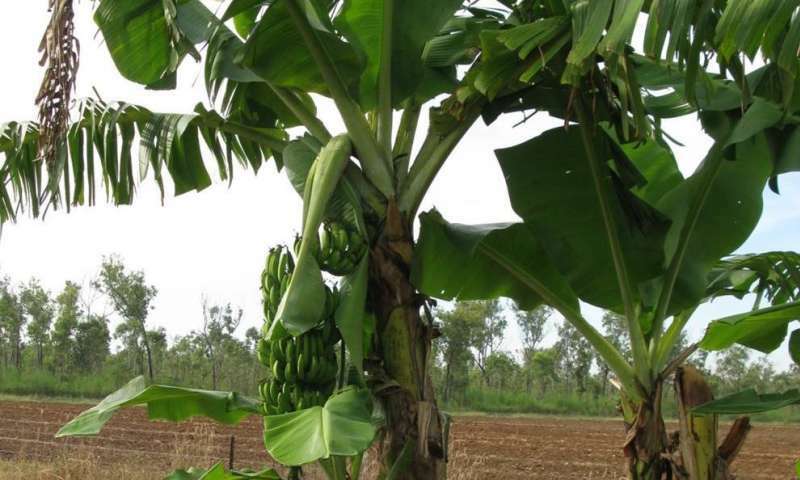 In a world-first GM field trial conducted in heavily TR4-infested soil, one Cavendish line transformed with a gene taken from a wild banana remained completely TR4 free, while three others showed robust resistance. The results have just been published in Nature Communications. 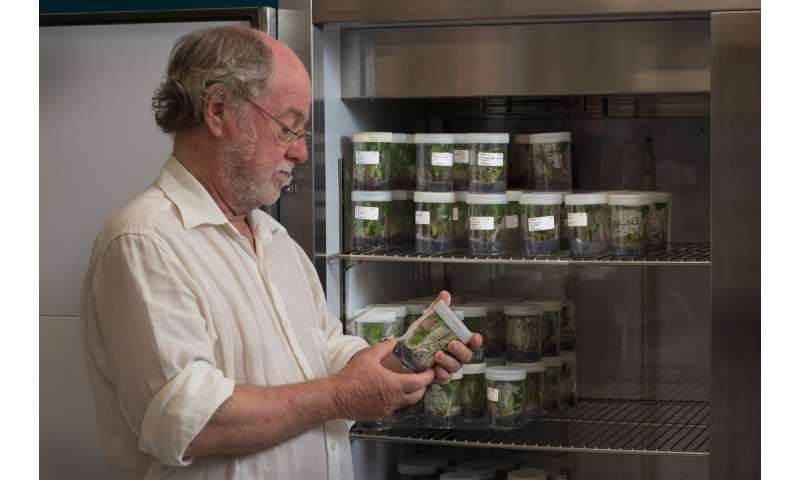 The field trial, which ran from 2012 to 2015, was led by Distinguished Professor James Dale, from QUT's Centre for Tropical Crops and Biocommodities. It was conducted on a commercial banana plantation outside Humpty Doo in the Northern Territory previously affected by TR4. The soil was also heavily reinfested with disease for the trial. Professor Dale said the outcome was a major step towards protecting the US$12 billion Cavendish global export business, which is under serious threat from virulent TR4. "These results are very exciting because it means we have a solution that can be used for controlling this disease," he said. "We have a Cavendish banana that is resistant to this fungus that could be deployed, after deregulation, for growing in soils that have been infested with TR4. "TR4 can remain in the soil for more than 40 years and there is no effective chemical control for it. It is a huge problem. It has devastated Cavendish plantations in many parts of the world and it is spreading rapidly across Asia. "It is a very significant threat to commercial banana production worldwide." The researchers have begun an expanded field trial on the same Northern Territory plantation, growing the four RGA2 lines that showed resistance in the last trial, as well as newly developed lines of modified Cavendish Grand Nain and Williams cultivars. They will have the capacity to grow up to 9000 plants and quantify crop yield over the five-year trial. "The aim is to select the best Grand Nain line and the best Williams line to take through to commercial release," Professor Dale said. "While in Australia we primarily grow Williams, in other parts of the world Grand Nain is very popular." Professor Dale said the correlation demonstrated between the RGA2 gene activity and TR4 resistance opened up new research. "We can't make the assertion that the RGA2 gene is the gene responsible for the resistance in the original wild diploid banana, because in the modified Cavendish we significantly increased the gene's expression - the level of its activity - over its activity in the wild banana," he said. "But we've established a correlation, and we've found that the RGA2 gene occurs naturally in Cavendish - it just isn't very active. "We are aiming to find a way to switch that gene on in the Cavendish through gene editing. We've started that project. It is not easy, it's a complex process that is a way off, with four or five years of lab work. "We're also looking at as many genes as possible in the wild banana and screening them to identify other resistance genes, not only for resistance to TR4 but to other diseases." Agreed, monocultures are flat out dangerous and variety should be encouraged. Here's to more tasty bananas!